Fiji-born Benjamin (Ben) Ashkettle runs more than 250 kilometres every week in preparation for marathons he takes part in around the world. 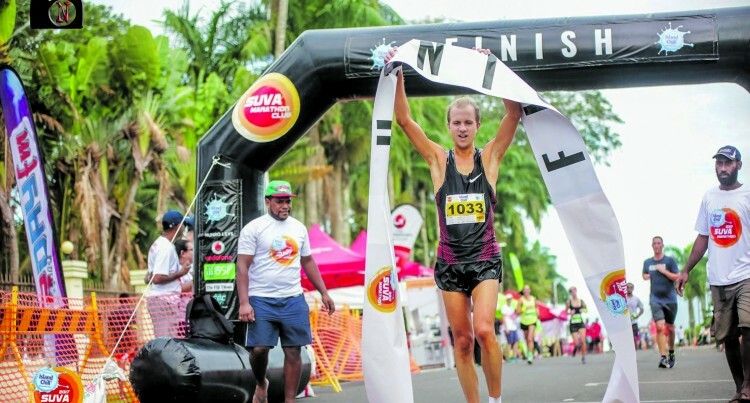 The Island Chill marathon defending champion Mr Ashkettle, 30, who has maternal links to Fiji gained his Fiji citizenship early this year. While back home to defend title tomorrow at Albert Park in Suva he is also using the opportunity to visit his mother in Lautoka. He’s currently coming back after some time out due to injury so will be running the half marathon tomorrow. Now with his citizenship long distance runner Mr Ashkettle, 30 hopes to represent Fiji in athletics. “It would be an honour to represent of Fiji at world athletics events such as the Olympics, but more importantly to do it in the best way I can by sharing more about our culture and traditions, and perhaps make at the same time important relationships to boost athletics and opportunities in Fiji”” Mr Ashkettle said. “To start things of I have been providing training and com­petition gear to those in need to boost participation and op­portunities in athletics here,” he said. Investment banker Mr Ashkettle, studied finance in Arizona, in America’s South West, threw it all in to run mara­thons for a living. The then 29-year-old won the 42nd Townsville Marathon in North Queensland on August 3, 2017 completing his second ever marathon in 02:22:49. Ashkettle, who is originally from New Zealand, but born in Fiji sliced a clean 1 minute 40 seconds off his previous course, earning $4000 for his efforts. But pounding the pavement had been a challenging hobby while spending 50 hours a week inside an office in Melbourne’s CBD. “I always put school first and graduated with a high distinc­tion in finance in northern Arizona,” he said. “I had an opportunity to go to a top business school on an athletic scholarship for four years. “In 2015, at the age of 26, I was an ordinary tennis player and soccer player. I developed a wrist injury while playing tennis and so I started jogging to stay fit. “Coincidently, my family was living near a track in Melbourne and I was invited by the local club to compete in cross country. While I was a decent runner at school house competition, I’ved never run at state level or anything like that. The very first race I ran for the club was the state cross country championships and I won by 1second. Of course, winning is motivating in itself, but simply being out amongst the tree’s, the trails, and the birds chirping was enough for me to fall in love with running. That still runs true today (pun). Shortly after winning his first cross country title he took to the track with the intention of being a metric miler. “That was the cool event at the time. I remember running 4.24 for 1500m three weeks in a row before I had a break­through. I ran 4.17, 4.09, 3.59 minutes across the next few weeks. “That was the moment I knew running could take me places. I was brought over to Northern Arizona University on a 4 year scholarship for the 3000m steeplechase in 2007. I had only been running for about 18months at that time, and had run 9.01 in the 3000m steeplechase, 14.32 in the 5000m, and had run at the World Junior Championships. 4 years later in 2011, I graduated with personal bests of 13.55 in the 5000m and 28.52 in the 10,000m. I knew then that I would become a profes­sional marathon runner. “I work part time as a corporate banker, and while I have the flexibility to train, I must ensure im getting enough sleep and recovery around work and running. Generally speaking, running is the therapy to any stresses I might have with my workload. Its defiantly more of a privilege than a challenge. The Suva marathon brings together local and international runners, corporate groups, supporters, and major sponsors such as Island Chill, Vodafone, BSP, and Munro Leys. Everyone involved is there to encourage a healthy lifestyle both physically and socially. The event in 2017 introduced me to many wonderful people both inside and outside of athletics. If you’re competing this year, I encourage you to hang around after the run and enjoy the opportunity of engaging with other participants as well as checking out the events sponsors and free food. It’s a win for everyone. n After meeting your nutritional needs, it is okay to have a few “bad foods” to reward yourself for the hard work of train­ing.